Okay, I thought I would share with some of my favorite blogs and newsletters. All are free and guaranteed to be interesting. Next up is “Beautybeyondbones” written by Rachel Mankowitz. Rachel writes about eating disorders and her despair and her redemption. She has written a book about the despair of eating disorders. She lives in New York City has had two cute little dogs. One of which has recently died. All about life in the big city. thefadingyear is a blog about Irish history, traditions and folklore. Here is an excerpt from the latest post. Reek Sunday, the last Sunday in July, is traditionally known for the great pilgrimage to Croagh Patrick, a mountain in County Mayo. Croagh Patrick, or Cruach Phádraig as it is known in Irish, literally means Patrick’s Stack, the site, according to hagiography, was where Saint Patrick fasted for 40 days. For over four thousand years Patrick’s Stack has has attracted pilgrimages, with the site originally hosting pagan gatherings which were gradually to become more Christianised from the time of Saint Patrick. It’s a bit obscure, but for someone of Irish heritage, I find it interesting. My brother is a published writer and has a blog about writing. The blog is richardbowker. By the way, you can buy his books from Amazon.com. Also, I have to buy them on Amazon. No freebies for his older brother, either. Note: He reads my blog, hint, hint. More about Richard. Next, is TheClosetAtheist. This is a blog about the daily struggles a young woman has over her beliefs in becoming an atheist and her relationship with her Christian family. Here is a bit about the author. Click here. For the past couple of years, I have felt as though, in this area of my life, atheism itself is all that I’m interested in. I wanted to read books that specifically laid out arguments for or against the existence of God, and I didn’t have much interest in books that were just about religion or just about science. Most people in the atheist community that I have encountered on WordPress and Twitter also have a fiery passion for science. There you have it. I hope that you find some of these blogs as interesting as I do. I am intending this for some of my friends that no longer do Facebook and might be looking for something different. Enjoy. So the first batch of Christmas Letters were mailed today. This batch was about 75 or so letters. This batch required no hand-written input from Paula. So off they go. I first started this annual project almost 20 years ago. I got the idea from Paula’s mother who sent out an annual letter. Paula wanted to hand write all of her Christmas cards. But I like the idea of doing the letter. The trade-off was that Paula would do a written addition to the letters that she wanted to send. So here’s my process. Throughout the year I gather potential photos to include. I start writing the actual letter in November. I try to cover all of the high points of our year, including where we have traveled, what our kids are up to, etc. Now that I’m retired, I have plenty of time to work on the letter. Back in the day, I wouldn’t even start on the project until the day after Christmas during the Holiday corporate shutdown. My goal is to get it on one double-sided piece of paper and leave enough space on the bottom for Paula to write something. I sometimes use a smaller font to fit everything in. Concurrently, I start working on the list. As of today, there are 135 people on the list. Last year, it was at about 120 or so. It seems that having sets of friends both on the West Coast as well as the East Coast has helped push the number higher. Then, I procure the paper and envelopes.The last couple of years, I got them from Amazon. I prefer a light background with not too much art work. I try to get envelopes and paper to match. Some years I have just got colored envelopes. It’s getting so that there is hardly anything that you can’t get from Amazon. This year I tried to streamline the process a bit. I created a “Xmas-Letter” group on my iPhone/iPad contact database. Each person that I wanted to send a copy got added to the group. Then I used a new app called “Label Printer” (Click for link in the Apple app store). There’s a free version that one can use to try it out. So labels get printed. First, check with Paula on whether the list is complete. One last edit of the actual letter. Paula gets the last look before I start the print run. Check the ink cartridges for sufficient ink. Nothing so maddening as to start running out of ink half way through the run. So by December 1, it’s time to start folding and stuffing into envelopes and putting labels and stamps on them. Then I sort them into two piles, ones that require input from Paula and those that do not. The ones not requiring input get sealed and mailed. It’s interesting to look back at my Christmas years gone by. The early ones from late 1990’s are crude by comparison. I added clip art but not pictures. My PC at the time (a Gateway desktop, remember them?) was crude by comparison to today’s laptops. Getting pictures on to the page took a good bit more effort. One year, I tried sending pictures only by email. Bad move. I will never do that again. I believe that our friends enjoy getting reading the mail, especially seeing as it isn’t a bill. So without further ado, here is the pointer to this year’s letter. Download if you like or wait for the post man. Well, I finally started reading the book “Wild” by Cheryl Strayed. As always, there is usually more to the book than what you find in the film. Here are a few thoughts. Cheryl Strayed hiked the PCT in 1995. This is mentioned in passing in the film. The book was published on 2012 and the movie released in 2014. For you in my audience that are challenged at math, that’s a long time. In the summer of 1995, the big story was OJ, the murder and trial. It was probably a good time to be off the grid for the summer. In the middle of the book, Ms. Strayed tells of running out of money. Part of her travel on the trail way by way of Greyhound. She skipped part of the trail due heavy snow in parts of the Sierras. So she says she was down to her last $0,65. No ATM’s in the wilderness. No ATM’s in some of the small towns in the Sierras. It also meant no cell phones. There were cell phones in 1995, but they were clunky affairs that didn’t work real well and were expensive to use. I had a cell phone back then. I think it was a Motorola flip phone. Back in the day, they had something called roaming charges. It could get real expensive to make a phone call. So it took Ms Strayed 17 years to get her book published. It reminds me what my brother Rich has told me. “Writing for a living is hard work.” Here’s a link to her wiki entry. There’s a section toward the end of the book on Crater Lake in Oregon, Crater lake is one of the deepest lakes in North America. It is about 1900′ deep at its deepest point. 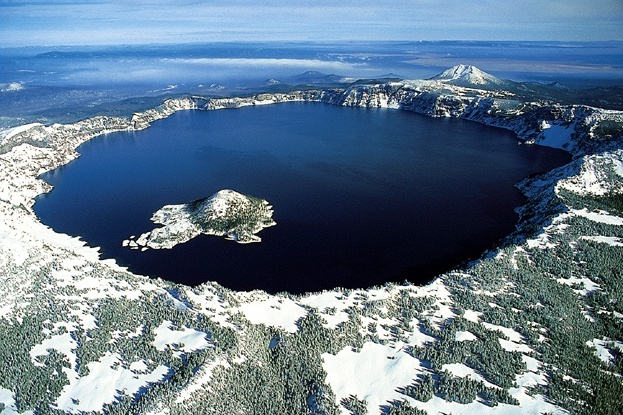 Read here for more info on Crater Lake. If you saw the film, go read the book. It’s worth it.